So come 11:05, having paid my €5.60, I was on the train to Cassis. By midday, I’d made my way into town at Cassis (the train station is a way out), taken a quick look over the beach (pretty girls getting their tops off: check; sand instead of pebbles: check; space to swing a cat: no check) and was on my way out of the tourist information centre with an inadequate but free tourist map and a largely useless brochure about the Calanques. Pro tip number one for anyone following in my footsteps: decent trail maps do exist – buy one. 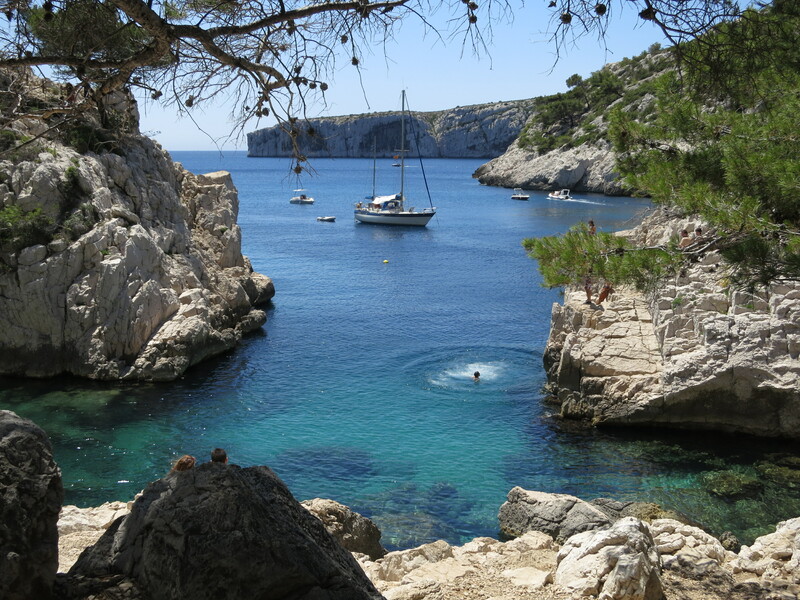 Here followed about seven hours of constant walking and climbing around the Calanques. Which are stunning. I realise that most people are a little more averse to that much walking than me, especially given that there’s really quite a lot of quite taxing clambering up and down steep valleys. 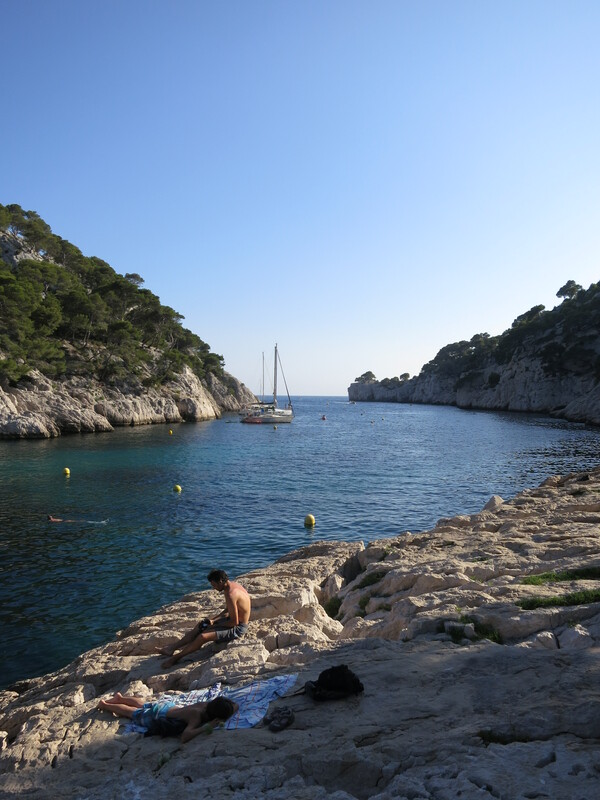 And so if you’re such a person and you find yourself in Cassis, you’ll be pleased to know that there is an excellent beach that is only an hour or so’s (admittedly difficult) walk/climb in, in Calanque En Vau. Either way, pro tips two and three: take plenty of water, and wear decent shoes. I did it in my FiveFingers, which was manageable but not ideal, since the trails consist purely of small stones exactly the wrong size for shoes with very thin soles (ie they’re pokey and they hurt). Oh, and I’m not kidding about the water – assuming you’re there on a warm day, you will sweat bucketloads. I drank more than four litres of water while walking around, plus another litre while eating dinner straight after. 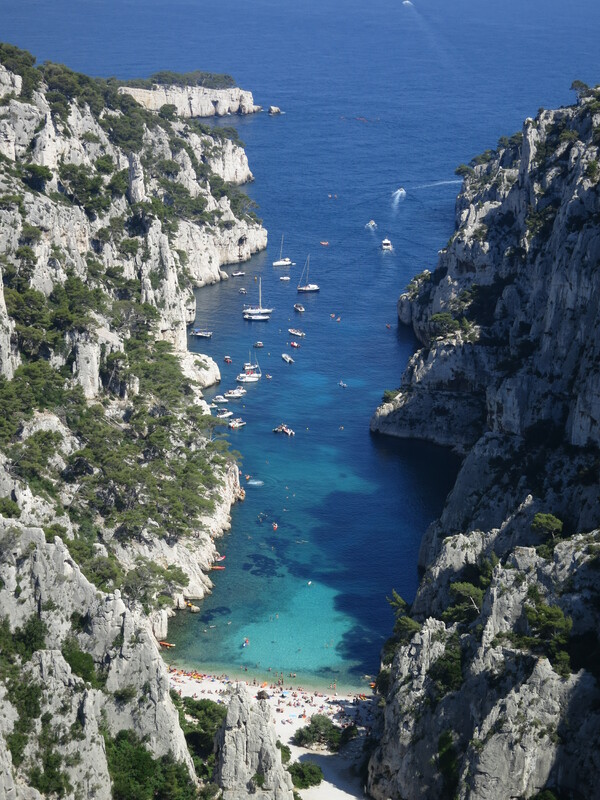 Other than that, there’s not a lot for me to say about Cassis – it’s better in pictures than in text. Oh, other than to thank the two lovely French girls I ran into on the way out, and who showed me a good place to dive in and cool off after a particularly sweaty stretch of climbing, before they kindly gave me a lift back into town. 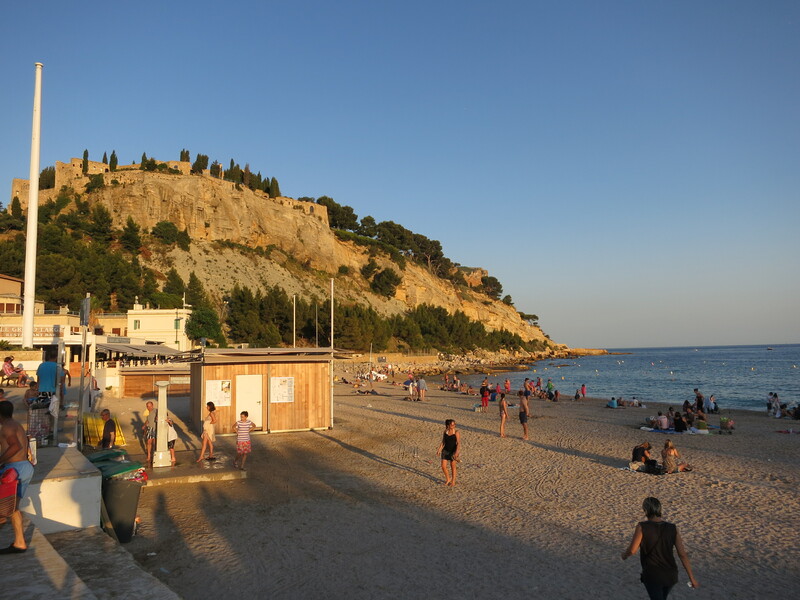 They’re staying in Cassis on holiday and are liking it, but they did explain that it’s a little too well-to-do for people in town to be friendly and approachable. They recommended I go to Sanary-sur-mer, which is apparently friendlier. So maybe I’ll do that. Oh, finally, pro tip four: see pro tip one, and get a decent map. 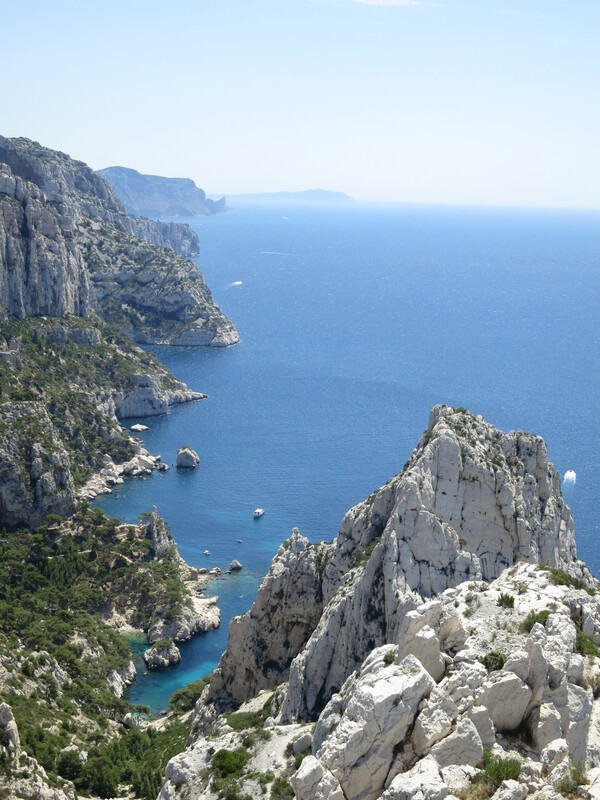 It’s apparently possible to walk along the Calanques all the way back to Marseille (to meet up with that number 21 bus), which I would really like to have done – especially for the possibility of seeing them at sunset. Instead, I spent sunset somewhat less spectacularly, sitting at the train station writing a draft of this post while waiting for the last train back. I’m sure I could have walked it, too – I think I probably got close to half way before turning back, and by the time you add the 3.5km walk from town to the train station (the shuttle bus had stopped running), I wouldn’t be surprised if I covered about the right distance. 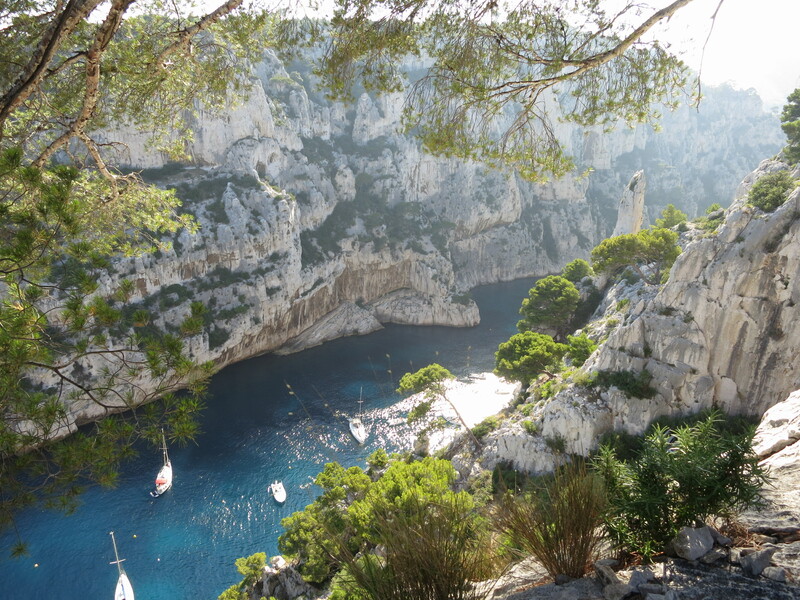 You can indeed get to the Calanques from Marseille on the number 21 bus – I did it the next day. Catch it right to the end of the line, and wander into the national park that sits directly behind where the bus parks at its final stop. A few slightly easier bays to get to, perhaps, if you’re not quite so up for clambering through valleys… Still stunning, though. This entry was posted in Travel and tagged france by Sam Roberton. Bookmark the permalink.